I really, really did not expect to enjoy this meal. I didn’t even set up my camera or think of photographing it for the blog until long after the dish was made. This recipe just screamed “I dare you to make me.” The cookbook is copyrighted 1970 and is entitled A Dollar a Day . The entire thing, including the recipe I made, screams 70s. SCREAMS. The recipe called for canned tuna. I keep that around because the Omnivore likes to make himself tuna sandwiches. I don’t like tuna sandwiches. Or canned tuna at all. The cookbook has no pictures and I was just darned curious about what made this “Puffy Tuna and Rice” so puffy anyway. As I read on, I realized it was the separation of egg yolks from the whites and treating each component of the egg differently to achieve distinct results. So I decided to make it. It consists of ingredients standard to my pantry anyway: rice, frozen peas (my addition), canned tuna. I didn’t really have to go out of my way to make it. And if I hated it? So what. I’d still eat it. I do things like that. I’m a trooper. But I didn’t hate it. I liked it a lot! Sure, it screamed casserole but is that so bad? The rice disappeared amongst the puffiness from the egg whites. I bet your family would never even notice the brown grains in there. And yolks made for a thick and rich sauce and although the recipe called for cheese, I omitted it and didn’t miss it one bit. I don’t think I like tuna with cheese anyway. In the interest of full disclosure, though, I must admit that the Omnivore only thought this meal was “okay.” Yes, he ate is full portion and enjoyed it, but he admitted it was not something he’d request again. Maybe if I’d added the cheese it’d be a different story. Whisk together oil, flour, water, milk, and salt. Heat over medium heat in a small sauce pan. Add egg yolks and whisk continuously, about 3-4 minutes, until the mixture is thickened. Beat egg whites with an electric mixer until stiff and frothy. 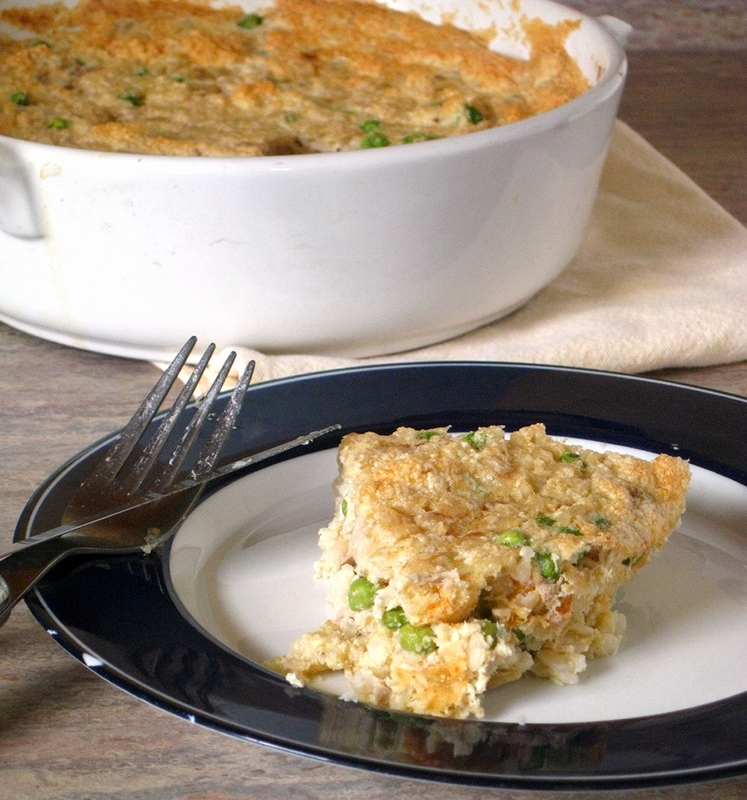 In your casserole dish, combine cooked rice with peas. Mix in drained tuna and incorporate sauce throughout. Carefully fold in egg whites until just combined. Cook in an oven preheated to 350* for 35 minutes. I think everyone’s got one. That one ingredient that is irresistible. For some it is goat cheese, for others it is caramel. For me, it is peanut butter. And that fact is particularly dangerous because peanut butter is found in dinners and desserts, meaning I’m always on the defensive. Me vs. eating all the peanut buttery food. Well, not even just peanut buttery food: the Omnivore doesn’t have enough fingers to count all the times he’s found me simply devouring a jar of peanut butter with a spoon (or a knife; I live life on the dangerous side). We’re not talking about 1 single spoonful, either. So there you have it. My favorite ingredient. In truth, I think I like it better in savory applications than dessert. This meal would be my last supper. This pizza is my favorite. This soup is amazing. And this meal is worthy of a Valentine’s Day repeat. All because of one thing: peanut butter. 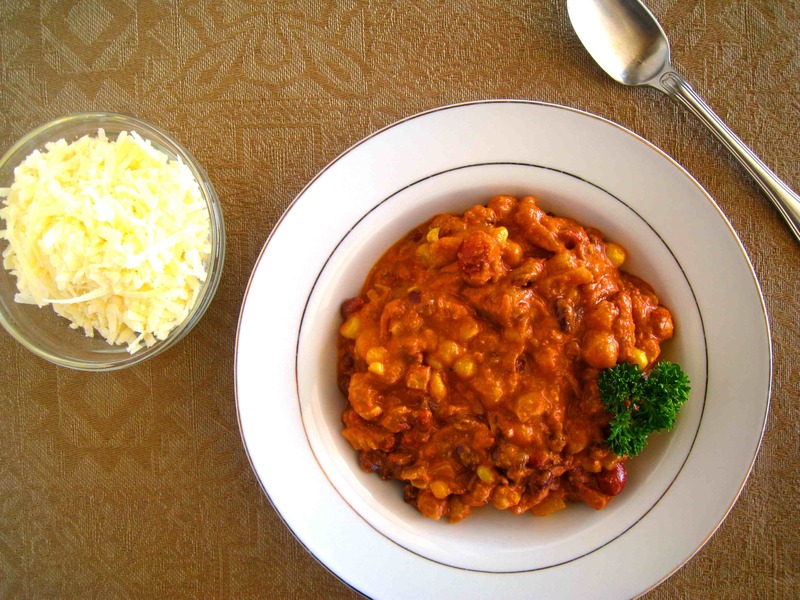 Most people’s secret ingredient in chili is cocoa powder. Mine is peanut butter. And this is hands down my favorite vegetarian chili recipe You know, I’m living by myself, and forced into eating the same meal many, many times in one week. And even after three consecutive lunches and dinners of this stuff, I wished I’d made a larger batch. *I use dry beans cook in my pressure cooker instead of canned beans listed below. In large stock pot, heat olive oil over medium heat. Add onion and garlic and sauté until the onions are translucent, about 4 minutes. Add crushed tomatoes, black pepper, salt, cayenne pepper, paprika, and red pepper flakes. Let simmer for 5 minutes and then add vegetable stock and peanut butter. Stir until well incorporated. Let simmer for 10 minutes. 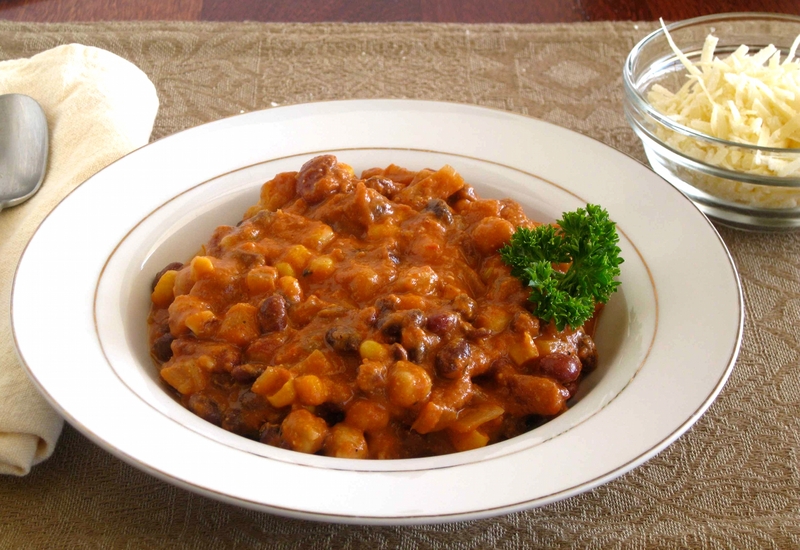 Reduce heat to low and add all beans and corn. Let simmer for 20 minutes. Serve with shredded cheese. I appreciate one pot dinners, I really do. We’re all busy and sometimes it really is just best to throw everything in one pot, cook it up, and dish it out (bonus points if it is a crockpot). But the other day in my spare time (didn’t I just say I was really busy?) I was thinking about what makes a dish restaurant worthy and what makes a dish just a good dinner at home. I came up with one key feature (I told you I was busy, I didn’t have time to take this brainstorm any further): layers. And one pot dishes, our fall backs when the days seem to short and the schedules seem too long, just don’t achieve that. This meal shines specifically because each component is cooked individually and spiced in different, but complementary, ways. The flavors were slightly Indian, but not in an offensive-I’ve-never-had-Indian-food-and-am-scared way. If you don’t have ground coriander you could substitute ground cumin. And the squeeze of lemon at the end? A must – or you’re back to just eating dinner at home instead of a restaurant quality meal. Cook as directed on rice packaging. In a skillet, warm a little olive oil and coat pan. Add onion. With heat on medium-high, let onion cook, without stirring, for about 3 minutes. Using a spatula, scrape onions off skillet at the end of 3 minutes, add garlic and spices, reduce heat to low, and cook 5 more minutes until onions are very soft. Set aside. Bring split peas and water to a boil. Reduce heat to low and cook 25-30 minutes or until softened. Add curry powder and salt. Continue to cook, stirring occasionally, until the split peas reach the consistency of spaghetti sauce. Prepare your plate by placing a layer of rice on the bottom of your dish. Next, add a ladle of split peas. 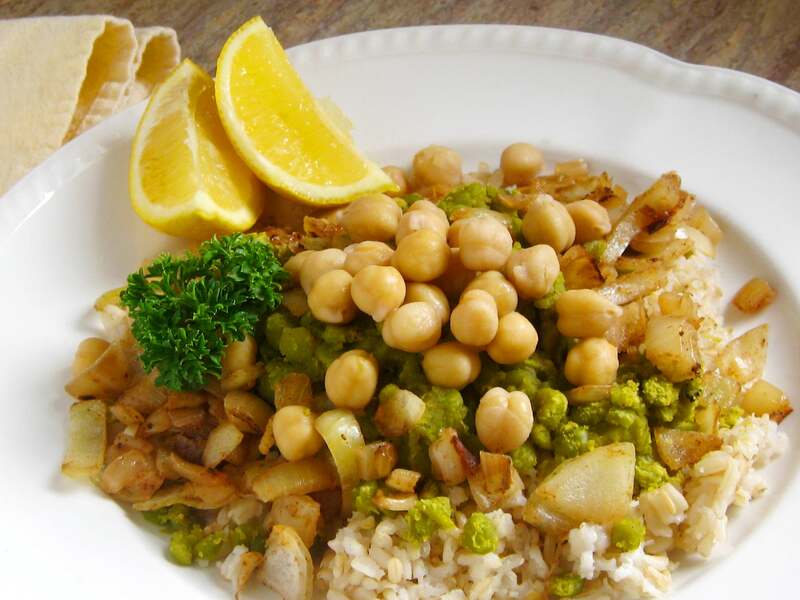 Add cooked onion around the perimeter of the peas and top with garbanzo beans. Squeeze a slice of lemon on top just before eating. Wow! Thank you to the nearly 50 participants who contributed to my Charity Souper Bowl. Since many of you homecooks contributed more than one recipe, this brings my donation to the ASPCA to a whopping $56. In addition to my donation, many bloggers personally told me that they’d be making private donations inspired by this event. Thank you, Thank you! After the jump is a list of all the participants with a link to the blog and the recipe itself. Below that list, there is a detailed round up of entries as well as photos of many of the soups. Remember how the Omnivore and I don’t live together? And how he visits me on the weekend? And how I don’t have a car? So that means when Saturday comes I get really excited to see The Omnivore‘s car! I get to go grocery shopping which is exciting. And because there’s no such thing as a stop at the market unless it is on a Saturday, I make a list, and stick to the list. At least that’s the plan. But this past weekend I cruised by a fennel bulb on my way to the oranges. Yes. A fennel bulb. Not a stack o’ fennel. Just one. It looked pretty good, so I grabbed it. It *might* have been my first time cooking with fennel. So I was excited! This salad was so.good. So GOOD! 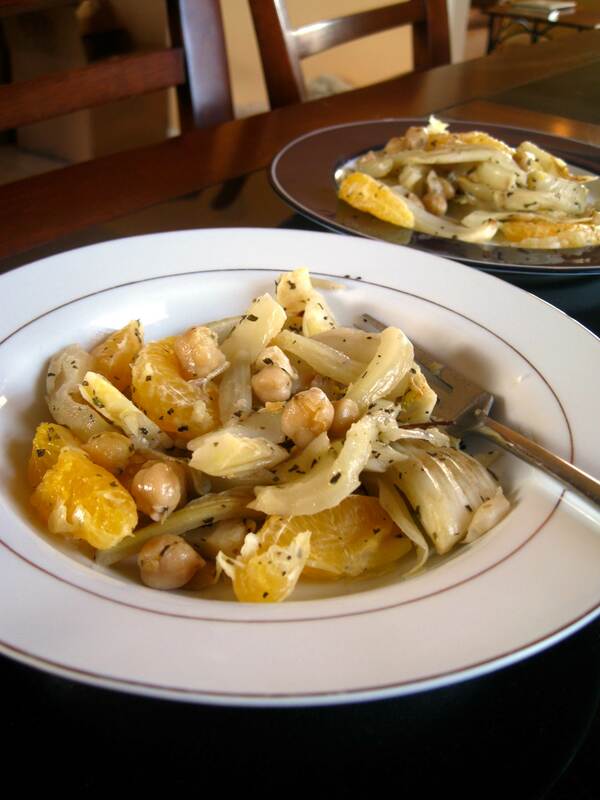 The unique flavor of fennel becomes softer when it is roasted as in this recipe. 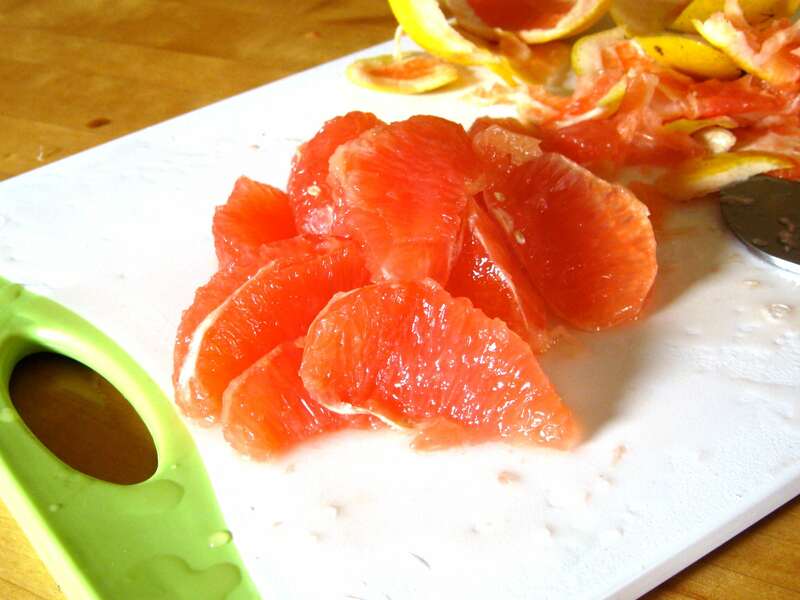 And this is such a great time for citrus – those flavors just popped. Chickpeas were a natural addition and provided something substantial. For the record, I don’t think scallions would have been very good in this recipe anyway. Pre-heat oven to 375 F. Remove leafy tops of fennel bulbs. Slice the fennel bulbs lengthwise into 1/4-inch strips and place in a baking pan. Add extra-virgin olive oil, water, salt and dried spices. Give all ingredients a good stir with a wooden spoon. Spread fennel and chickpeas evenly on baking pan and bake until fennel is tender and has soaked up most of the broth and olive oil – about 30 to 35 minutes. Stir occasionally. 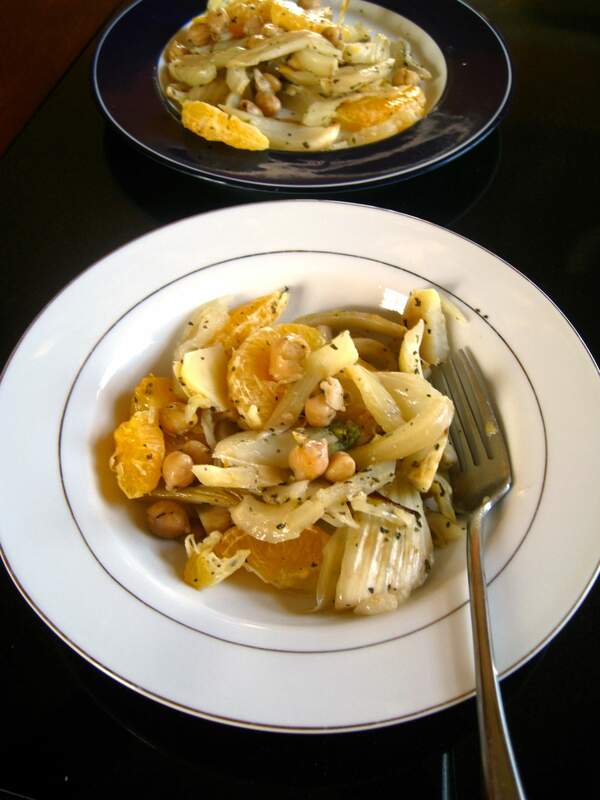 While fennel and chickpeas are baking, peel oranges into sections. When fennel and chickpeas are finished in the oven, combine all ingredients in a large bowl, toss well, and season with sea salt and pepper, if needed. I have a tendency to challenge myself for no particular reason. You know that saying, “Why did you climb the mountain?” and the response, “Because it’s there.” Well that’s me. Even in the kitchen. 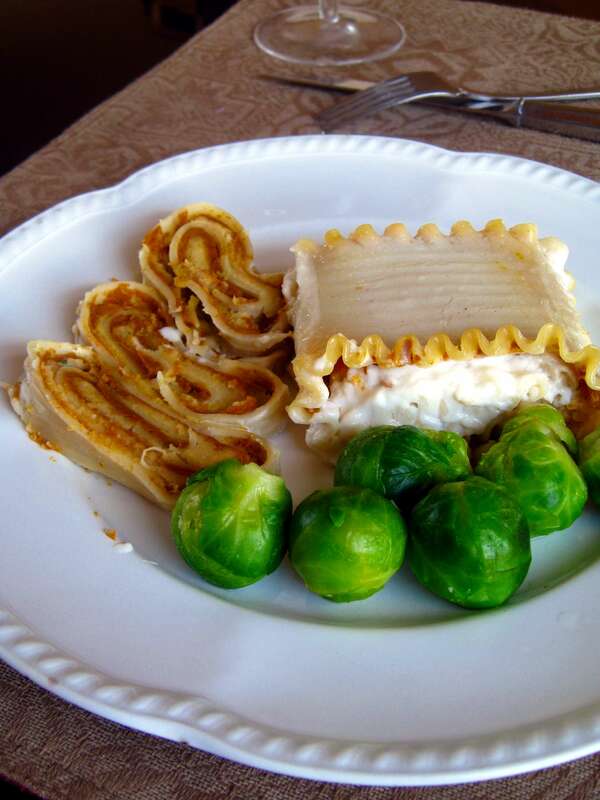 You see, I have a favorite pumpkin lasagna recipe, but it isn’t vegan. I know, I know. I’m not even vegan. Lasagna isn’t supposed to be vegan. But what if it was? Could it be just as good? Yes. It can be. I got it into my head one Wednesday that I needed to make a rich, creamy, vegan pumpkin lasagna. (Except I didn’t have a baking dish so I had to make lasagna rolls but that’s a different story). My first thought was coconut milk goes really well with squash. My second thought was what the hell am I going to do with that rutabaga I bought at the grocery store last week and why did I buy IT (only one)?. So I got to thinking about turning rutabaga into something that would pass for ricotta cheese filling. I’m sure the same process could have been done with turnip or some other white vegetable (cauliflower?). So after the storm (the brainstorm) was over, I must say, I had created a wonderful, completely vegan, lasagna. And it wasn’t dry and uncheesy. It wasn’t light and uncomforting. It was what I wanted it to be. What I needed it to be. Perfect. Bring a large pot of water to boil on a stove. Drop in lasagna noodles and simmer until pliable, 5-6 minutes. Place noodles to cool over the lip of a large mixing bowl, draping one portion of the noodle on the outside of the bowl and one on the inside. Reserve 1/2 cup pasta cooking water. In a bowl, combine pumpkin puree with spices listed. Boiled a peeled rutabaga or turnip until easily pierced with a fork. 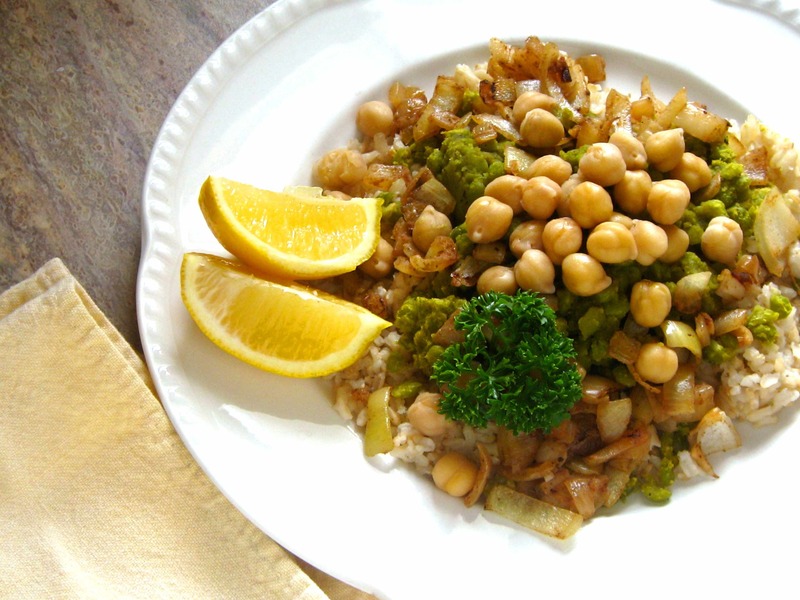 In the bowl of a food processor, combine cooked root veggie with chickpeas. Turn processor on and stream in reserved water until a ricotta-cheese-like texture is achieved. Add salt and pulse a few times. In a sauce pan, melt buttery spread. Add flour and cook combination a few minutes until golden. Whisk in coconut milk and bring to a simmer. Cook 7-8 minutes until thickened. Add nutmeg and set aside. 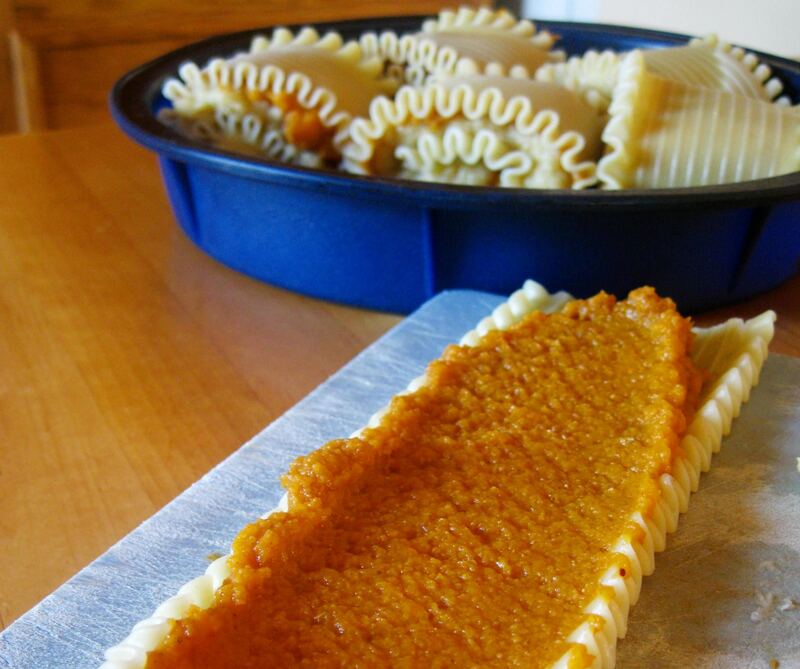 Assemble rolls by laying noodles out and spreading pumpkin mixture along the length of the noodle, leaving the end of the pasta furthest from you a little thin in the pumpkin department. Dollop chick pea mixture down the length of the noodle as well, being careful not to leave too large of a dollop near the last 1″ or so of the noodle. 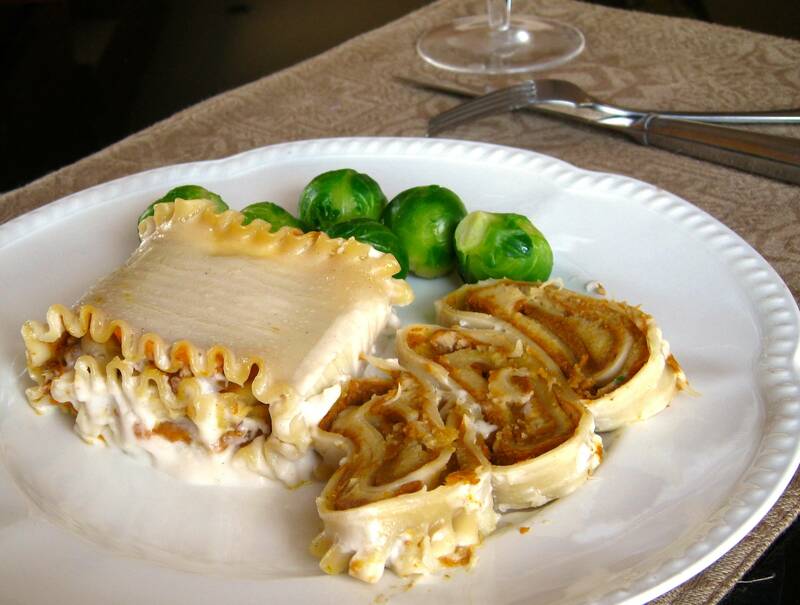 Roll lasagna roll away from you, and place seamside down in a greased cooked vessel. Repeat with remaining ingredients. You will not have any remaining pumpkin but will have chick pea mixture left over. 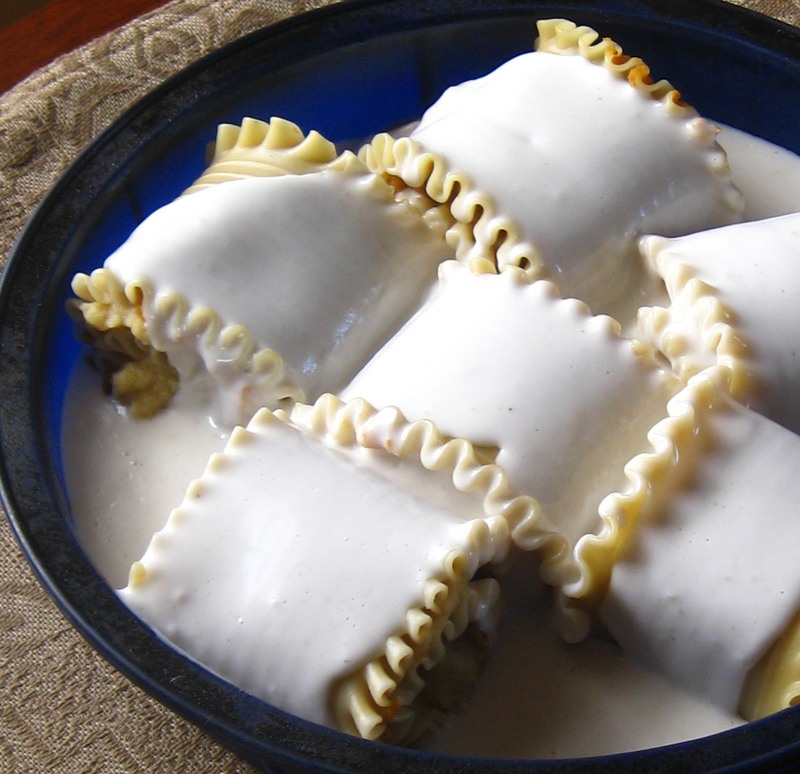 Pour coconut bechamel over prepared noodles. Bake in a 350* preheated oven, covered, for 25 minutes. Enjoy! I’ve been eating a lot of grapefruit lately. I don’t mind peeling them like an orange and chowing down, but I know those tough membranes get in the way of some people’s enjoyment of this fruit. 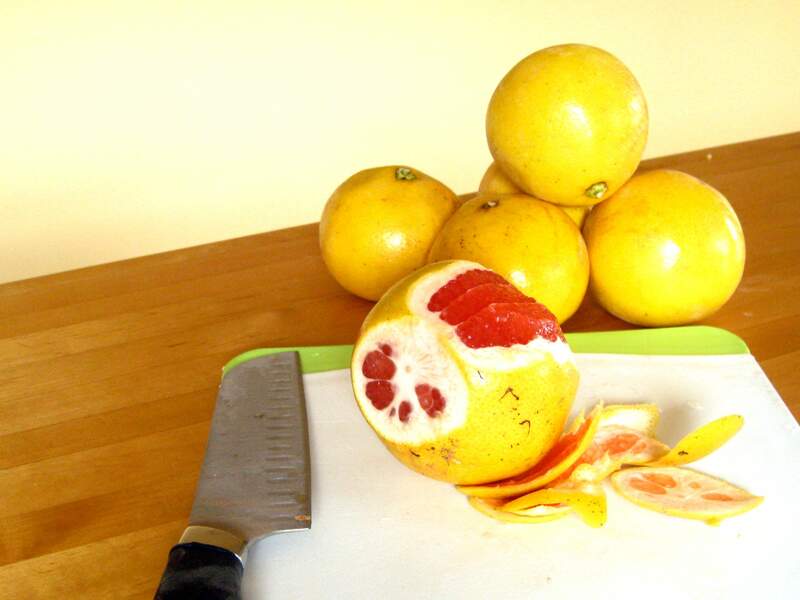 I thought I’d show you a quick ‘how-to’ on segmenting a grapefruit. The first thing you do is cut off a portion of the peel along the north-south pole of the fruit. I usually just cut on the side where the stem used to grow. This creates a stable surface for the fruit to sit on. Then set the grapefruit down in this new, more stable position. 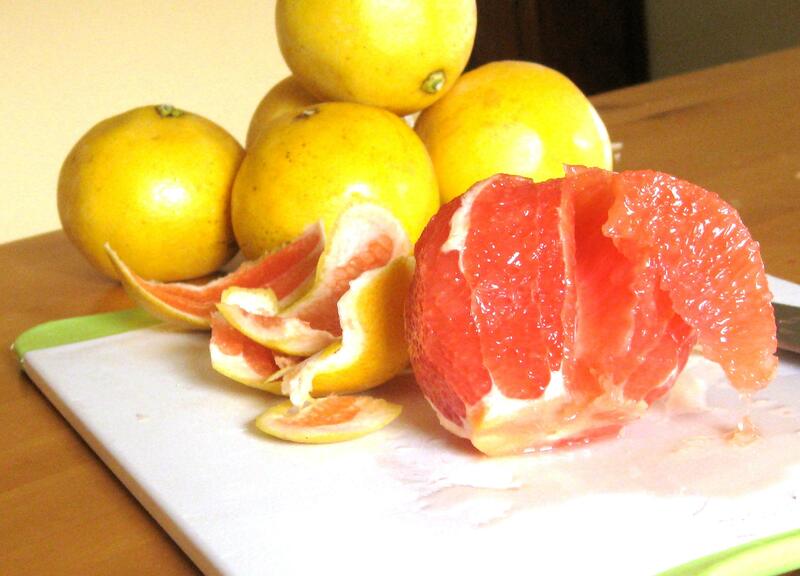 Cut from top to bottom along the curve of the grapefruit, removing all of the peel and white pith. Go ahead and trim up the areas where you didn’t cut deep enough to get rid of all that white stuff. Next, hold the grapefruit in your left hand if you are right handed (lefties, do the reverse). Using your knife, making a vertical slice along the top-to-bottom white lines you can see. Your knife needs to follow the inward angle of the membrane. Next, make the same type of slice along the membrane line immediately next to the first slice. Turn the blade of the knife inward and the segment should pop out. Continue all around the grapefruit. 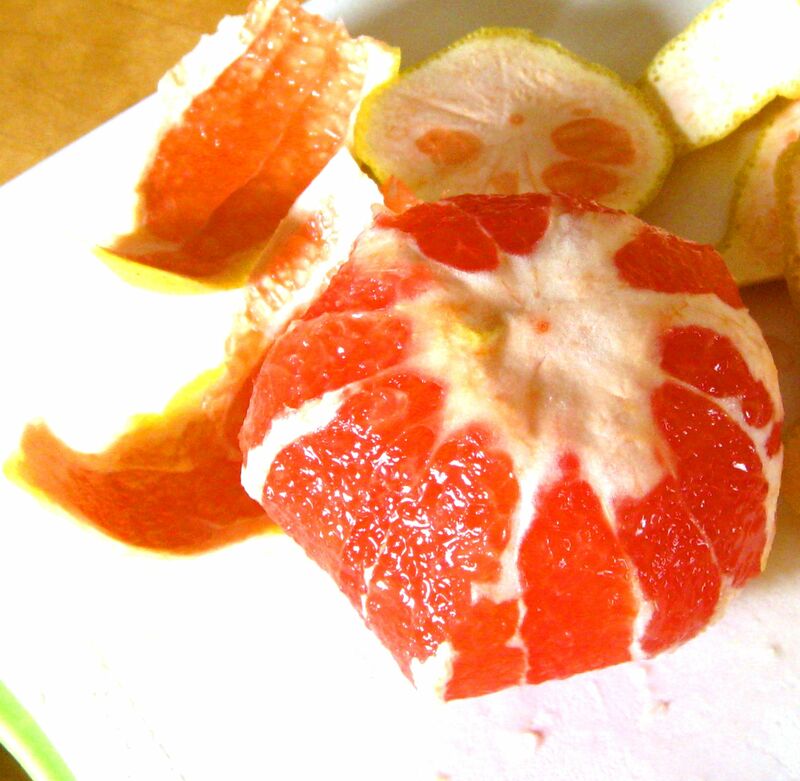 In the end, you’ll be left with a pile of juicy grapefruit segments and a wad of grapefruit membranes.